Pickling is a funny pursuit. It starts with simple pickles of just cucumbers, like refrigerator pickles, and then moves on to more complicated techniques, like fermented sour pickles. Eventually you start pickling other vegetables like radishes and zucchini. I am know unable to resist a good pickle or pickling recipe. 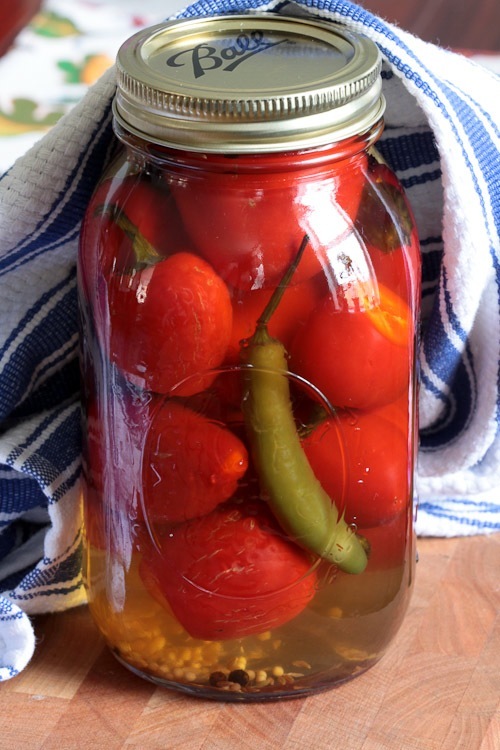 When I came across this recipe for pickled peppers on Michael Rhulman’s blog, I had to give it a try. The recipe is from a new book by Michael Symon, Live to Cook, which Rhulman collaborated on. Of course when I say, “Give it a try,” I mean leave out half the ingredients either because I couldn’t find them or I was too cheap. Even after I butchered the recipe, it still came out great. Instead of using expensive sherry vinegar, I used cider vinegar. I also couldn’t find a wide variety of peppers at Safeway so I ended up just going with Jalapenos and cherry peppers. Oh, and that Marojam? I left that out as well. And guess what…the pickles still came out great. This is a very robust recipe that can stand up to even me hacking at it. As long as you get the vinegar, sugar, salt and water ratios right it pretty much can’t fail. I liked the cherry peppers the best. 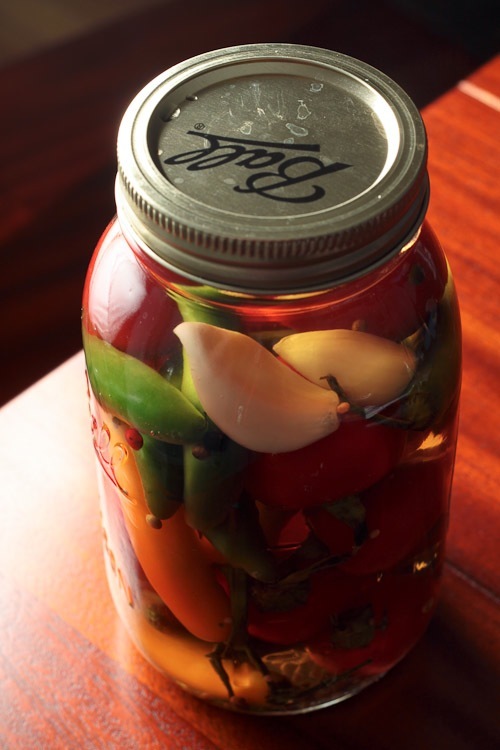 The sweetness and fruitiness of the brine works perfectly with the cherry peppers. The first batch I made was perfect. I could eat a couple of peppers without them being too hot. The second batch was a lot hotter though and I had no problem breaking a little sweat. I guess the same variety of pepper can have a range of hotness. Batch three is going to be a plethora of peppers I picked up at the farmers’ market. They weren’t labeled, so I am hoping none of them are extremely hot. From: Michael Rhulman’s blogChoose a colorful variety of chillis, fresno, jalapeno, banana, tomato, serranoâ€”the thick fleshed peppers work best. The method is very simple; simply fill a jar with peppers, bring the pickling liquid to a simmer and pour it hot over the peppers. You can use them once they’re cooled but they’re best after they’ve been sitting in the pickle for a few weeks. They’ll keep for a long time–how long, I don’t know because I always use them up for I can find out. 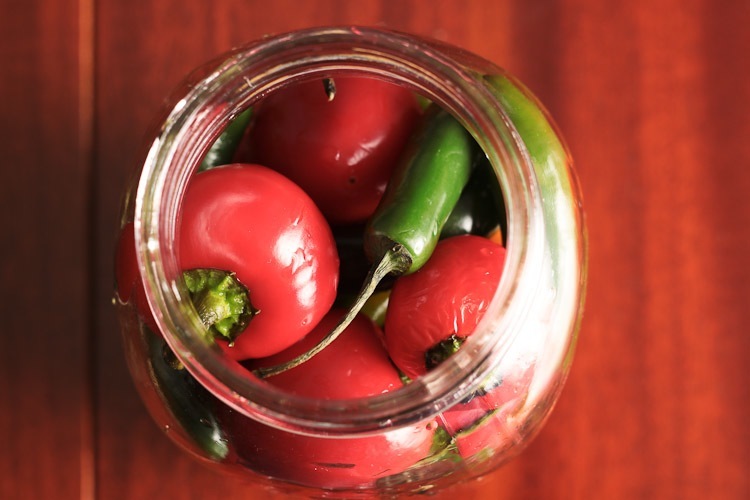 Place chillis in a jar and cover them with water. Pour off the water into a measuring cup. Note the volume, pour off half the water and replace it with vinegar. Add 2 tablespoons sugar and 2 tablespoons salt for every three cups of liquid. Combine your liquid and remaining spices in a pot and bring to a boil. Reduce the heat and simmer for 5 to 10 minutes, then let cool slightly. Pour the pickling liquid over the peppers, screw the lid on and refrigerate. To use, slice into rings, chop or mince depending how you want to use them. It looks good, and I have an overabundance of peppers… gotta try this! I will try this very soon. It looks great. Does the current recipe reflect the measurements for kosher salt or table salt? I used kosher salt. The original recipe didn’t specify, so I am not 100% sure. Kosher salt worked great though! To me cooking is all about adapting. If I tried to follow every recipe to a T I would be a broke mofo with a ton of leftover stuff that gets thrown in the compost bin. I am in pepper overabundance right now with my garden and we are talking about a massive canning weekend of peppers. Really curious what the cider vinegar does because I normally always pickle with white vinegar but have been seeing a lot of people using cider lately. These sounds so great with the end of summer here! I can’t wait to try this over the weekend! Us Texans love us some peppers! This will be perfect at a cookout! Wow these look excellent!! I really love your pictures! Not sure if the recipe mentioned this, but if you use pickling salt (no iodine added) or even sea salt, you can avoid that cloudiness in the brine. Lovely peppers, though, I might have to steal your idea! That is a great point! I used Kosher salt which also does not have any iodine and prevents that cloudiness. I am going to update the recipe because the measurements are for kosher salt and would be different for table salt.